Two of today’s best-known business thinkers get to the heart of strategy—explaining what it’s for, how to think about it, why you need it, and how to get it done. And they use one of the most successful corporate turnarounds of the past century, which they achieved together, to prove their point. A.G. Lafley knows something about successful corporate strategies. As former CEO of Procter & Gamble (P&G), Lafley, with the help of strategic adviser Roger Martin, doubled P&G’s sales and quadrupled its profits. 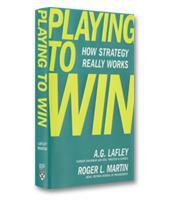 In Playing to Win, Lafley teams up with Martin, now the renowned dean of the Rotman School of Business in Toronto, to outline a step-by-step process for developing and implementing a successful strategy. 1. What is our winning aspiration? This choice refers to "the purpose of the enterprise," the authors write. For Oil of Olay, it was to become a leading skin care brand again. 2. Where will we play? This second choice identifies specifically where the product or company will compete. The Oil of Olay brand stayed with its mass market retailers (e.g., Target and Wal-Mart) rather than the prestige stores (e.g., Macy’s). But it positioned itself as a "masstige" product — higher end (and higher priced) than the traditional mass market beauty product. 3. How will we win? This question must be answered with a clear value proposition and a path to competitive advantage. Among Oil of Olay’s winning strategies was producing a better anti-aging skin care product — a product at the right price (e.g., not too low) that would entice the prestige customer base. 4. What capabilities must be in place? The task here is to define the activities and competencies that support the where-to-play and how-to-win choices. Oil of Olay, for example, was able to leverage P&G’s strengths in consumer understanding and brand building. 5. What management systems are required? Likewise, strategists must define the systems, structures and measures required to support the choices. Oil of Olay was also able to leverage P&G’s systems as well as its channel and partner systems. This framework can be applied at all levels of the company, including the organization level, strategic group or, as in the example above, the single business unit, the authors write. Clearly, the choices need to support each other among the different levels. While most of the book is dedicated to the five-choice framework, Lafley and Martin offer two additional tools to support the strategic choice process. The first is a structured methodology for analyzing the company — specifically its industry, customers, relative position to competitors and the potential competitor response to your strategic choices. The authors also offer a "reverse engineering" process to test potential strategic choices. Tools, of course, can go only so far. Reading this book will not make you into another A.G. Lafley — his success at P&G is much more than a function of methodologies. However, by helping strategists focus on the important where-to-play and how-to-win questions, Playing to Win is an invaluable map that gives business leaders at least a fighting chance for a successful journey.